Located in the heart of the Epcot area of the Walt Disney World Resort is the award-winning Walt Disney Swan and Dolphin Hotel. This resort offers deluxe accommodations and dining, as well has being located in a prime area for touring the Walt Disney World parks. Let me start by saying this hotel is grand! We were blown away by the amazing architecture and towering design of the two Swan and Dolphin buildings. The Swan and Dolphin Resort is known for being a conference hotel, and the grounds are expansive to easily handle multiple events and activities. With the sun shining overhead you might even feel that you’ve been transported to your own island resort. One of our favorite parts of the Walt Disney Swan and Dolphin Resort was the amazing grotto pool. The landscaping and layout of the grotto pool area is breathtaking. Kids will love the waterfall and water slide, adults will love the plentiful lounge chairs and soft rustling of the palm trees blowing overhead. Of course, some adults might like the water slide too! There are also two lap pools for those who want to work in some exercise or are looking for some quiet relaxation. Getting to and from the Walt Disney World parks is a breeze if you’re staying at the Swan and Dolphin. The hotel is located in walking distance to Epcot, and you can also walk along the Boardwalk to take in the active nightlife. Shuttle buses are provided to take you to all the Walt Disney World Resort attractions, including the water parks and Downtown Disney. Our favorite experience was taking the water taxi boat to and from Hollywood Studios. Additional Disney World perks you’ll enjoy while staying at the Swan and Dolphin are: Extra Magic Hours at the parks, complimentary Disney purchase package delivery, and free parking at the Disney parks. If you’re all about food when you travel, you’ll have your pick at the Swan and Dolphin. They have 17, yes SEVENTEEN, dining options varying from quick service and casual to signature fine dining like the Todd English’s bluezoo, Shula’s Steak House, and Il Mulino New York Trattoria. We enjoyed a wonderful character breakfast buffet meal at the Garden Grove restaurant as well as eating dinner at their quick service Picabu Buffeteria one evening. We stayed in a two double bed room at the Dolphin Hotel; the Swan has queen beds. Our room had an amazing view of Epcot and overlooked the water. One evening we were able to sit and watch the Epcot fireworks show from our room. Here’s my YouTube video of our room and other pictures from our time at the Walt Disney Swan and Dolphin Resort. The Walt Disney World Swan and Dolphin Resort is part of the Starwood hotel group, so if you’re a Starwood Preferred Guest you can earn and/or redeem points for your stay. And if you’re looking for a little adult time during your vacation, be sure to check out their Camp Dolphin program for kids and the new Mandara Spa. For a fun family outing, you can walk over to the Walt Disney World Fantasia Miniature Golf course for a round of putt-putt golf. Your family is sure to love staying at the Walt Disney Swan and Dolphin Hotel on-site at Walt Disney World Resort! 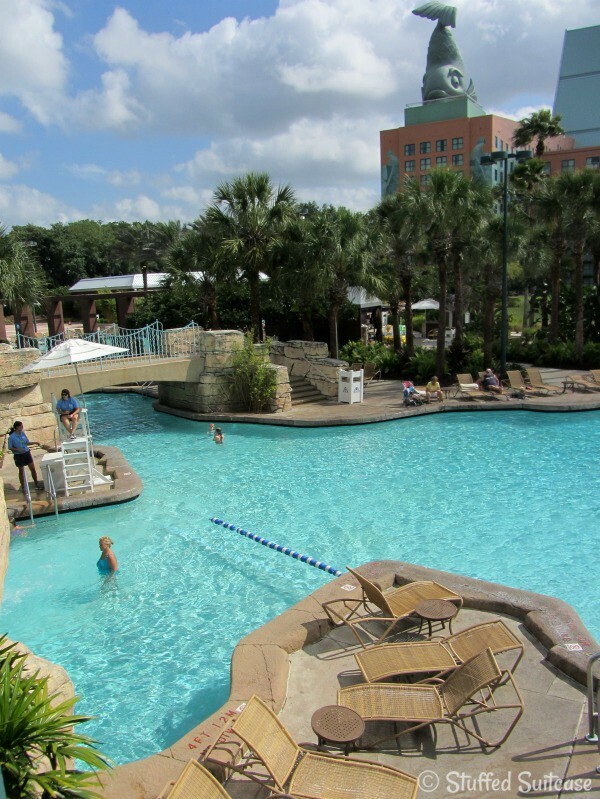 Here’s another post about the advantages of staying at the Swan & Dolphin. If you want to stay at a Disney branded resort, use this Disney World Hotel Planning Worksheet + Resort Perks and Where to Stay at WDW: Value, Moderate, Deluxe. You can also read this post to help understand the differences between the WDW resorts. Don’t miss these tips on flying to Walt Disney World to help you start your trip off right! Thanks for sharing. We have not had the chance to stay there yet on a Disney trip but it looks very nice! It was such a great place. Loved the location! That’s sounds terrible Amber! So sorry your family experienced that! Thankfully our stay was very nice and we didn’t have any of those issues. I know that hotel issues can really put a damper on your vacation! Love your pictures! I’ve considered staying a the Swan so many times but then I start to think I can’t live without Magic Bands and the Magical Express! Did it feel like you were at Disney? That’s the main appeal of staying on property for us. The Magic Bands do make a big difference to helping you feel on property, but at the hotel it’s really just about charging and room keys. You can still use a magicband for your tickets if you have some from old trips or want to purchase new ones. :) Since the S&D is located on property right next to the Epcot area, I did feel that we were on property still. You still use the Disney bus and boat transport, and I believe you get magic hours too (or used to at least). That being said, it’s not the same as staying at say the Beach Club, but it’ll probably save you some money, and earn you points if you’re a Starwood rewards user.